Bay laurel vitality essential oil has been traditionally used to support a healthy respiratory system*. It is a powerful antioxidant* and may support healthy immunity*. This oil has been used since Ancient Greece and Rome. Spiritually, in the Middle Ages the laurel or bay leaf tree was often planted in front of a house for protection, and to promote success. It symbolically represents victory and brings back memories of the Olympic Athletes and Ancient Romans who wore it as a wreath on the crown of their head. Want to Purchase Therapeutic Grade Bay Laurel Vitality Essential Oil? Go to the Oil Shop! Buy Bay Laurel Oil here! Why is this information important? It’s always important to know your genus species of your oil. Just the common name on the bottle doesn't really tell you exactly what you’re getting. The Laurel family contains up to 4,000 species of plants including avocado, cinnamon and the camphor tree. Make sure you know what you are using for the appropriate application. For instance, many of us use the California or Indian species of bay leaf for cooking; but the European species cited here may have different constituents. Where did the name come from? 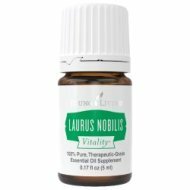 Lauris comes from the Latin word meaning "to praise"; and nobilis comes from the Latin word meaning "renowned or famous". Why know about this number? ORAC stands for Oxygen Radical Absorbance Capacity. It tells you the antioxidant capacity of a food item. This was developed by the USDA researchers. For instance: Oranges = 750; Clove = 1,078,700. Wow! The number for clove is NOT a typo! What are the Documented Uses and Benefits of Bay Laurel Essential Oil? Supportive of healthy respiratory system and immune system*; provides antioxidant support; has cleansing properties. Want to Learn about Bay Laurel Vitality's Emotional, Spiritual and Other Aspects? Then go to Bay Laurel or Laurus Nobilis Page! Dietary Supplement: place several drops in capsule with olive oil and take internally. If you prefer dilution, use 50:50 dilution-one part essential oil: one part vegetable oil. Use for antioxidant support*. Place in favorite recipe as a seasoning for soups, sauces, marinades, stews, and pickles. Bay laurel essential oil is Generally Regarded As Safe (GRAS) by the FDA. Although it may be used as a dietary supplement, it is advised not to use it in this manner for children under 6 years of age. This oil should be avoided during pregnancy.